Here is a product I love! Only 70 calories for 1/4 cup! This recipe is so simple. It's 1lb chicken breast. I cooked the chicken with a squirt or two of fat-free Italian dressing in a slow cooker first. Then I chopped it up and add 1 cup of reduce fat Cheesy Ragu Light Parmesan Alfredo. Makes 6 bandster portions. 135 calories per serving with 19g protein. Butterfly chicken breast half and beat flat with meat mallet. Season with favorite herbs. I used salt, pepper and dried basil. Add 1/4 cup or reduce-fat or fat-free cheese and a slice or two of chopped deli ham or turkey and roll. Secure with tooth picks. Bake until chicken is cooked (180 degrees). If you wanted to add a few more calories, you could lightly cover the chicken in bread crumbs and pan fry in a little oil. Baked chicken dries out quickly...try not to over cook. Add 1/4 cup of Cheesy Ragu Light Parmesan Alfredo to top. 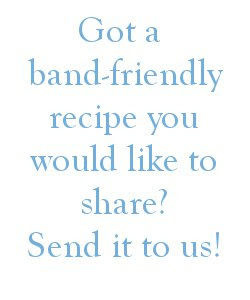 Makes 2 bandster portions. 200 calories per serving with 23g protein.